(MENAFN - Gulf Times) Hi-tech, cheap — and quiet. 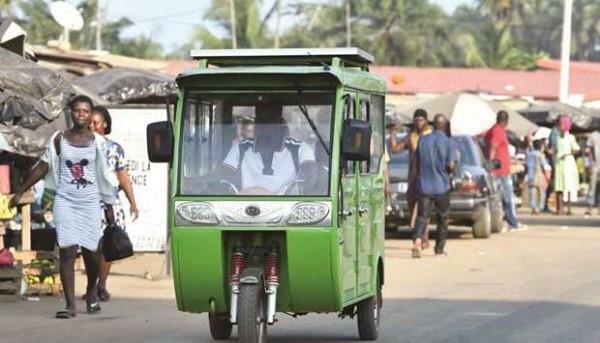 The Ivorian resort of Jacqueville just outside Abidjan is betting on solar-powered three-wheelers as it looks to replace traditional but noisy and dirty bush taxis. 'It's cheaper and relaxing! says local trader Sandrine Tetelo, of the Chinese-made 'Saloni or 'Antara tricycles, which could eventually spell the end for old-school 'woro-woro four-wheelers as Jacqueville looks to make itself Ivory Coast's premier eco city. The mini-cars, 2.7m long and two metres high, are covered in solar panels each fitted out with six 12-volt batteries, giving the vehicles a range of 140km. 'We are used to seeing (typically old and beaten up) bush taxis pollute the atmosphere and the environment. We said to ourselves, if we could only replace them by solar trikes, said Beugre. 'The adventure started in January with two little cars, added Togbe, who has created a partnership with local businessman Balla Konate. 'I went to China with a friend, says Konate, 'and afterwards I sent four youngsters to Lome for training with a friend who had spoken to me about the project. 'Today, a dozen cars are up and running. We are right in the test phase. More and more people are asking for them, says Beugre, seeing a chance to kill several birds with one solar stone. For the start of the school year in October, Jacqueville plans to bring on stream a 22-seater 'solar coach designed to help deal with 'the thorny issue of pupils' transport. Many schoolchildren typically have to travel many kilometres from their home village to urban schools. 'We're on the go from six in the morning and finish around 10 or even midnight, weekends too, says Philippe Aka Koffi, a 24-year-old who has been working as a driver for five months. 'It's pleasant for doing your shopping more quickly, says an impressed passenger, Aholia Guy Landry, after riding in a vehicle which can carry four people, driver included. A big plus is the 100 CFA francs ($0.18) price of a trip — half a typical downtown 'woro-woro fare — helping to attract between 500 and 1,000 people a day, according to the town hall and promoter. The wells outside the town produce 235mn cu ft of gas per day, while several foreign firms run pipelines taking oil and gas across the town to feed the refineries at Abidjan. But the municipality — with a total budget 140mn CFA francs — sees none of the profits, an issue which has drawn public ire in the past. The 50mn CFA trike project is just one piece in a much larger jigsaw which includes the construction of a new eco city on a 240 hectare site among coconut trees. 'It will not be a city for the rich, insists Beugre, showing off a blueprint replete with cycle paths and a university. 'All social strata who respect the environment will be able to live there, he adds. Ivory Coast, west African leader in electricity production — 75% of which comes from thermal energy and the remainder from hydroelectric dams — is targeting an 11% share of national consumption for renewables by 2020. 'Our ecological project will go all the way and 'stand up to the power of oil and gas, says the cowboy-hatted local politician. 'In years to come, we want to ensure that these solar-power machines become the main means of travel in the area.